Drink half gallon of water upon rising. Pretty drained right now..haven’t ate..only drank water..feel good but tired from the work-out, need to refuel.. Took 2 MSM capsules, 2 Omega-3 capsule, 2 Turmeric, 4 Maitake Mushroom capsules, 3 Garden of Life men’s live probiotics. 6 grams of spirulina/chlorella 50/50 mix tablets, 1 table spoon of coconut oil and some multi vitamins. Made a smoothie consisting of 2 carrot, 1 celery stalk, half a beet root, 1 tbsp of cacao nibs, 2 tbsp of chia seeds. Now I feel like a million bucks and bam energy galore. I feel like I am ready for another 2500 meters..My skin is tingling and my muscles are back on track feeling rejuvenated. My head is straight, I have mad concentration. I feel like taking a written exam but I don’t have one to take. I am ready to go to the beach now! I went to Newport Beach and checked Balboa, flat and sand is all screwed up. Went to M street and checked the waves and went out and skimmed for 45 minutes, it was alright but nice to get in the water and get some extra exercise in. Finished up and headed to Mothers Market for a juice real quick before yoga. Lunch: 16 oz of Juice, carrot, beet, chard, ginger, kale with cayenne pepper, downed it and went to go start some bikram yoga. Bikram Yoga for 90-minutes, I felt so good in the beginning and could feel my skin rushing with blood towards the end. Kept my self motivated with positive friendly thoughts and motivational thoughts like “You got this son”, “Only 6 more postures” “This is butter” (I was really barely making it through the last postures” I was so focused during class though, my eyes were dead on myself in the mirror. I was so focused and in tune with my body that I totally blocked out everything and actually did the wrong pose only to put my head up and find every body in the savasana position while I am doing another posture. Embarrassing but funny. I was so in my zone. Class is done, feel like a million bucks, clean and fresh out of the shower. Time for some grub. Dinner: 2 portabella mushrooms, 1/2 cup of organic white mushrooms, 1/2 cup of raw organic sauerkraut, 1/2 cup of quinoa. Trying to keep it light, juice and water with light vegetables to get the body cleansed. Trying to avoid any animal products and heavy foods, trying to keep it light, no sugar, not even fruit so I can deplete my glucose stores and start fresh and start getting my fat burning stores going as my carbohydrate intake is low. I don’t do juice much but I want to cleanse a little and keep it light on the stomach for a couple days. Wake up around 7:30AM. Waking up was easy but my body needed rest from the long day prior. Breakfast: Drink half gallon of water upon rising, took probiotics, omega-3’s and vitamin D3 (Since I will be at work). 1 shot or BrianOn and then went to work. Had a cup of chia seeds, cacao nibs and zeolites mixed in a cup. approximately 2 tablespoons of each. Very satisfying. Went to Mother’s Market, got another juice. Carrot, Ginger, Beet, Chard, Cucumber. Got 1/4 lb of kale and a cup of peas. Ate it, delicious. Had 1 cup of Gynostemma and Reishi/Green Tea for post lunch / early afternoon. Took 2 capsule of renew me. Went to the beach, skimmed for 1-hour. Craving seafood so I gave in and had a Whole maine lobster then I went an ate 1.5 lbs of steamed Alaskan King Crabs THEN I ate 3 cups of lentil soup, 1 cup of quinoa and a plethora of like 3 cups of Raspberries, strawberries, blackberries and blueberries.Did approximately 500 push ups spread out throughout the day.Went to sleep at 11:00PM. Wake up at 7:23AM – I feel great, waking up is much easier. My body is slowly getting more in tune with the circadian rhythms and thedetoxing and eating clean while exercising is keeping my mind nice and clear, no waking up foggy.Breakfast: Drink half gallon of water upon rising, took probiotics, omega-3’s and vitamin D3 (Since I will be at work). 5 grams of Spirulina and Chlorella. 1 tablespoon of Bee Pollen then took 1 shot of Brain on and then went to work eating 2 celery stalks. Took 2 renew capsules at 10:00AM, Ate my chia seeds, goji berries, cacao nibs and zeolites mixed in a cup, 2 table spoons of each. Lunch: I had a big bowl green cabbage like 6 cups and half an avocado with Apple cider vinegar. Had Gynostemma Tea and Reishi/Green tea for post lunch / early afternoon. Went home, swam 65 laps in my pool as hard as I can, approximately 29 minutes, did some sit ups and push ups then went to bikram yoga and did bikram for 90 minutes. Dinner: 1 cup of raw saukraut, 3 cups of lentil soup, 2 cups of quinoa, 2 cups of potabella mushrooms and white mushrooms, handfuls of cilantro. Late night snack: Had some frozen strawberries, fresh strawberries, blue berries, blackberries and raspberries. Did approximately 500 push ups spread out throughout the day. Woke up feeling really clean and good, energized. Much more than last night. Woke up around 7:27AM. Breakfast: Drank half a gallon of water upon rising, took probiotics, omega-3’s and vitamin D3, 5 grams of spirulina and chlorella, was rushing so didn’t have time to thaw BrainOn but took 2 capsule of renew me, I feel great, had 2 celery stalks to go. 10:00AM, Had the “oatmeal” concoction, chia seeds, goji, cacao. Lunch: 6 cups red cabbage, 1 whole avocado with lemon and apple cider vinegar. Took some ashwgandha, pine pollen, cistanche, cacao powder, nettle root powder, maca and agaricus mushroom. Went home, took 2 shots of BrainOn and 1 tbsp of bee pollen, super rejuvenated now from work and swam 70 laps in my pool, approximately 35 minutes as hard as I can, did some push ups and sit ups with stretching. Dinner: Had “dolma” which are grape leaves but use quinoa inside instead of traditional dolmas, had bowl of boiled beets. Craving sushi and gave in, got sashimi sushi. 1 pint of coconut gluten-free lactose-free arctic zero ice cream. Had like 8 loquats. Woke up at 7:40AM. Feel tired but good since I didn’t get as much sleep as usual.Breakfast: Drank half a gallon of water upon rising, took probiotics, omega-3’s and vitamin D3, 5 grams of spirulina and chlorella. Took 3 shots of BrainOn and 2 renew me, this made a drastic difference in my energy. I don’t feel sluggish anymore and my mind is on ready to go mode, I also ate 6-8 loquats. 10:00AM, Had the “oatmeal” concoction, chia seeds, goji, cacao with zeolites mixed in. Lunch: Big Kale Salad with cherry tomatoes, half an avocado with apple cider vinegar and lemon dressing. Post Lunch around 1:00PM had handfulls of goji berries and cacao nibs. I also had 1 tsp of each of the following powders; Pine Pollen, Cistanche, Nettle Root, Maca, Cacao, Tribulus and Mucuna. 3:45PM took 2 renew capsules, 2 reishi capsules, 4 multi-vitamins. Feel much more energized. Feeling really hungry through, it’s like my metabolism is ripping through everything I eat. Time for some tea. 4:15PM, have 2 cups of Reishi/Green Tea and 2 cups of Gynostemma Spring Dragon Tea. Work is stressful but if it weren’t for the BrainOn and renewme caps, I wouldn’t be nearly as relaxed as I am coping with the environment of work. All the supplements post lunch boosted my energy and overall vitality. Need to swim for like 45 minutes today as I have been invited to fine sushi dining which I can’t resist. 2-days in a row, bring it on. Zeolites, Chlorella, AFA, BrainOn, and Spirulina for the win as these are factors conjoined when eating sushi or fish to detox and protect my body from the contaminants. Decided to switch it up. Went to the gym, wow. Ran 2 miles under 15 minutes then went to go do lift weights. Decided to play some basketball so I went and shot some baskets for like 20-minutes, went to weight room and did weights for 20-30 minutes. Dinner: Sushi again.. Didn’t eat a lot but had some nigiri sushi. Late night: Arctic Zero Coconut Ice-Cream and like 20 dates. Not the best finish. Breakfast: Drank half a gallon of water upon rising, probiotics, chlorella, spirulina, took 2 renew me and 2 shots of BrainOn. Feel good and super energized. Took omega-3 and some coconut oil. Had a elixir with pine pollen, cistanche, nettle, camu camu, coffee bean extract, coconut water, cacao nibs, cacao powder, goji berries, chia seeds and frozen strawberries. Went to The Raw Food World lecture and event in LA, had some macaroons, laughing giraffes macaroons. Dinner; You guessed it sushi, not the best sushi but it was good. Went home, you guessed it, Arctic Zero Ice Cream and like 25 dates. Alright day…Not the best. Breakfast: Half a gallon of water upon rising, 3 shots of Brain on and 1 tablespoon of Bee Pollen. 150 push ups, 300 sit ups, swam for 24 minutes as hard as I can. Did some yoga and stretching. Post work out; Coffee enema. Took 2 renew me capsules, turmeric, coconut oil, probiotics and omega-3. Popped tablespoons directly in mouth of pine pollen, cistanche, nettle and cacao. Dinner: Bowl of quinoa, amaranth, chia seeds, cacao nibs, goji berries, cinammon. Then I had another bowl of 2 cups of quinoa and 1 small avocado mashed and mixed in and cacao nibs mixed in with some lemon dressing. 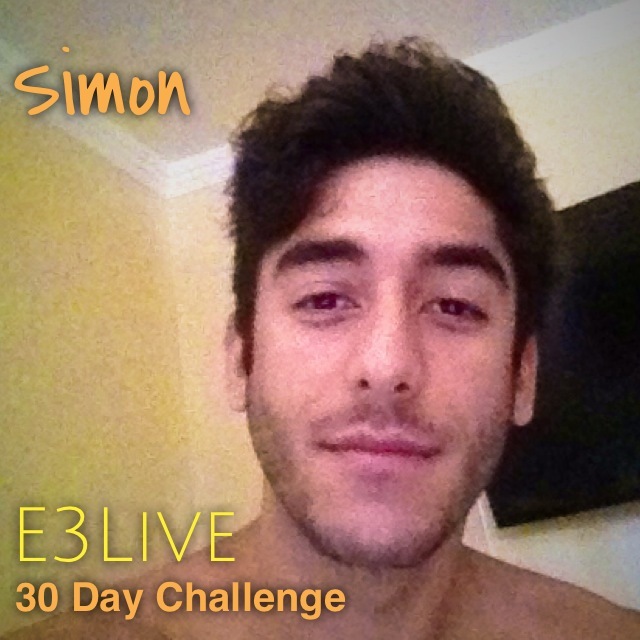 Simon – a 22 year old Purchasing Mana ger will be taking E3Live + BrainON and also E3 RenewMe for 30 Days! He loves Skimboarding, Bikram Yoga and most of all he LOVES food. In fact, sometimes Simon eats 8000 calories a day – so his goal is to lose 12 lbs. 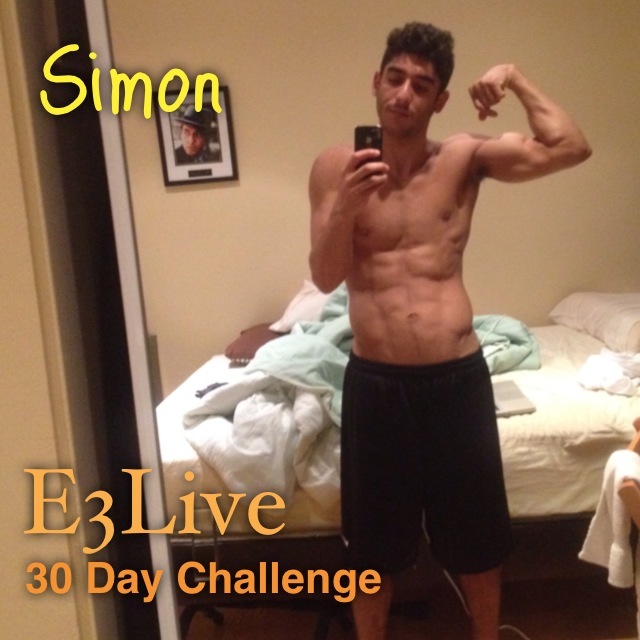 Cheer Simon and our other participants on in their E3Live 30 Day Challenge – and start your own #e3live30daychallenge too! 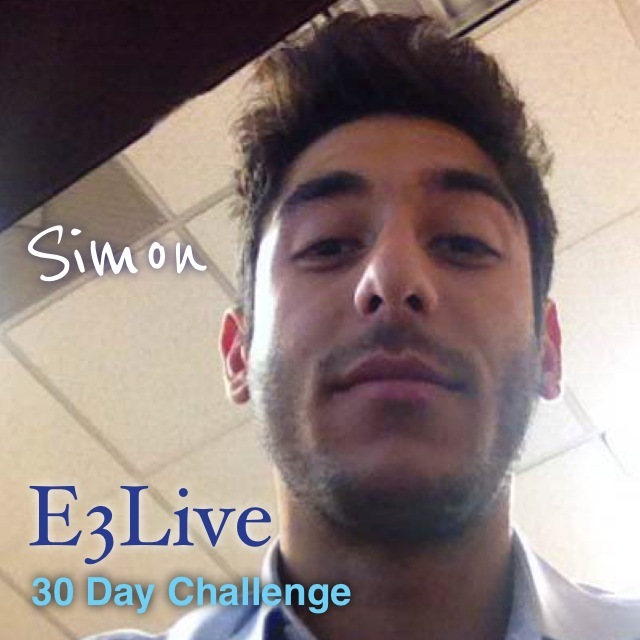 #e3live #brainon #whatareyouwaitingfor #nutritionstud #isthatsimon Go Simon!